NHRC Team today visited Central Prison, Tihar to inquire into important issues pertaining to Jawaharlal Nehru University Students Union President Shri Kanhaiya Kumar and forwarded inquiry report to Commission of Police, Delhi and Director General of Prisons, Tihar Jail for comments. On 16.02.2016, the Commission took suo motu cognizance of the newspaper report published in Hindu newspaper dated 13.02.2016 captioned "Govt. 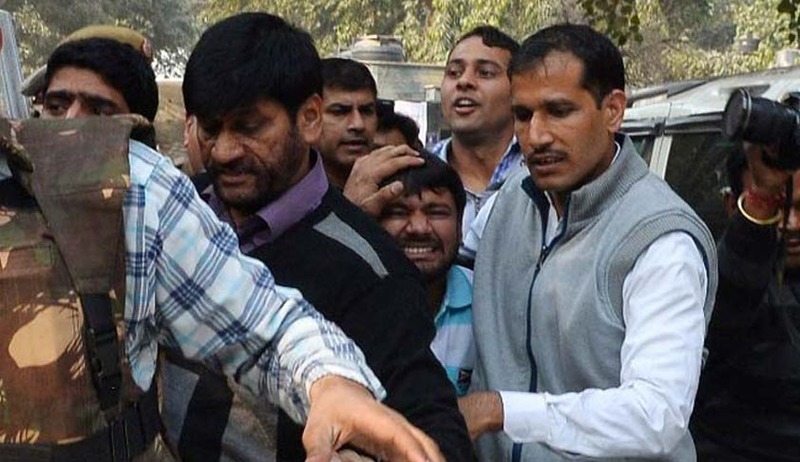 acts tough, JNU student leader charged with sedition". It was reported that the President of JNUSU was arrested on the charges of sedition after allegedly raising anti-India slogans. The Commission issued notice to the Home Secretary, Govt. of India, Chief Secretary, NCT of Delhi, Commissioner of Police, Delhi and the Registrar, Jawaharlal Nehru University. On 18th February, 2016, the Acting Chairperson, NHRC directed that a team comprising Shri. C. K. Chaturvedi, Registrar (Law) and Sh. S. K. Jain, SSP (Investigation) may visit Central Prison, Tihar to assess arrangements made and measures taken to ensure safety and security of Shri Kanhaiya Kumar in the prison and to ascertain the apprehensions, if any, in his mind with regard to his safety and security. The team also had agenda to ascertain the treatment meted out to him by the police and prison authorities while in custody and whether the statement released to the press by the Commissioner of Police, Delhi in the name of Shri. Kanhaiya Kumar was made by him voluntarily and without any extraneous influence. The Central Prison, Tihar has made special arrangements to ensure safety and security of Shri. Kanhaiya Kumar inside the prison. He has been kept in an independent and separate cell. Dedicated security staff has been deployed to ensure his safety and security round the clock. Several security instructions have been issued by the prison authorities in this regard. He has no complaints against prison official. According to Shri. Kanhaiya Kumar, he was arrested without any valid reason and without disclosing to him even grounds of arrest. He had not committed any offences as now alleged. However, this aspect is under investigation by the police. Shri. Kanhaiya Kumar did not complain of any physical assault by the police while in custody. However, he was subjected to psychological pressure during interrogation. The statement which was issued by the police as an appeal on behalf of Shri. Kanhaiya Kumar was not written by him voluntarily. The content, construction and framework of the statement were as dictated by the police. Shri. Kanhaiya Kumar was abused and physically assaulted by some persons dressed as advocates in the Patiala House court premises on 17.02.2016. He was even physically assaulted inside the adjoining court room in the presence of police who did not do anything to prevent the assault or apprehend the attackers even though they were identified by Shri Kanhaiya Kumar then and there. The physical assault on Sh. Kumar in the court premises appears to be organized and pre- planned. What happened in the Patiala House Court Complex on 17.02.2016 was a major security lapse on the part of the police. There was serious dereliction of duty on the part of the police. Going by the sequence of events, the safety and security of Shri. Kanhaiya and his family members is a serious cause of concern. A copy of the inquiry report submitted by the NHRC team has been forwarded to the Commisioner of Police, Delhi and the Director General of Prisons, Tihar Jail for their comments, to be received by the Commission, on or before 26.02.2016.